We want to thank each of you who have suppported Smile Alliance International with prayer, encouragement and by donating funds and goods to continue the ministry. A special thanks to those who were part of the six teams we worked with, joining us in ministry in Ukraine. At least 2500 people have been blessed this year because of your faithfulness. Breifly, I am working on updates on my blogs for those of you who are interested in what has transpired during 2008. Right now we are in the middle of distributing 900 plus gifts to widows, moms and kids through SAI and our partners. Smile Alliance International and Manna Worldwide are signing the final paperwork for a formal partnership which will eventually finish the Smile House Project. The first floor is half finished now but without dental equipment or furnishings. SAI will be responsible for the clinic. A transition home for 16 year old girls who graduate from Komorivka Orphanage is planned for the second floor and will be managed by Manna. Other plans for the remainder of the building are being worked out. So if you are interested, please check www.smilealliance.blogspot.com for general ministry updates, www.smilehouse.blogspot.com for the dental ministry updates, and www.livinginukraine.blogspot.com for everyday life updates. The Smile Alliance International website www.smilealliance.org is functioning but still needs a lot of work. We are posting a list of needs on it along with other pertinent information. God has been very faithful and your support has made this ministry possible. Thank you again. 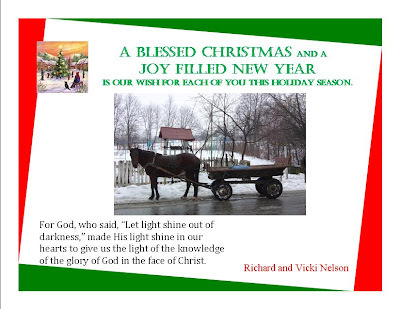 May you be indeed blessed this Christmas and in the year to come.